Sometimes my role as Dean for Diversity and Inclusion feels like doing a giant dot-to-dot picture. There are great ideas and initiatives going on across campus that just need that little extra help to shine. ONe way we do this is by using some funds originally given by the Vice Chancellor, to support projects proposed by staff and students. We recently asked for applications and funded 7 very different activities of which you will hear more over the next few months as they progress. However, I am delighted to be able to share here a review of the first activity, designed and delivered by Student Wellbeing in March 2017. This project, organised and run by Student Wellbeing, used a national event, University Mental Health Day – whose theme was ‘Active in sport’ – to raise awareness among students of the links between mental and physical health. The theme had a positive message that appealed cross-gender, to all ages and ethnicities and resonated with a general ‘look after yourself’ message. 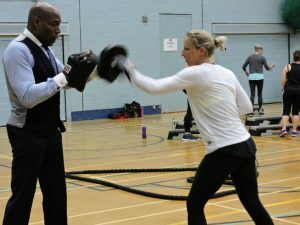 Funding was provided by a grant from Diversity and Inclusion Deans to pay for a high profile speaker (Frank Bruno, MBE), who is a strong and positive role model coming as he does from a BME background and who has publicly spoken about his own personal mental health struggles. Frank was invited to address the students at a specially organised ‘A conversation with’ lunchtime event. An additional activity was developed so that Frank appeared for a Super Circuits event at the Sportspark prior to this, to maximise the publicity opportunities that his visit afforded. Using this speaker opened up conversations among students about the relationship between mental and physical wellbeing. It inspired students to put steps in place to include activity in their lives, to support their mental and physical health. It increased awareness of mental health difficulties and provided social contact activities that were open to all. 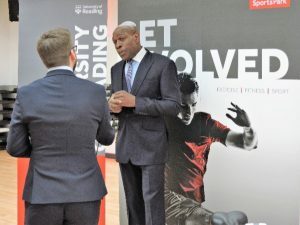 The ‘In Conversation with ‘event also provided a high profile positive focus for the University of Reading’s Mental Health Day, during which a number of other planned activities took place. Visible presence on campus to show that the University ‘cares’ about student and staff mental well-being. Promotion of Student Wellbeing to hard-to-reach target groups. At an International Women’s Day event I organised this week, colleagues and students listened, learned and debated as our inspiring colleagues delivered talks on a range of topics. Our large room was filled almost to capacity and there was laughter, solidarity and reflection as Professor Clare Furneaux, Dr Brian Feltham, Dr Orla Kennedy, Professor Rachel McCrindle and Dr Mary Morrissey delivered passionate, research based speeches on topics including Women in Engineering, gendered relationships with language, women and weight, the meanings embedded in Hillary Clinton’s ‘likability’ issues, and the relevance of Jeremy Bentham’s model of the Panopticon in relation to discriminatory mechanisms. This is an annual event and every year I am staggered and impressed by our students’ level of engagement with issues of equality. Since the Noughties, there has been a persistent narrative around the political apathy of the younger generations; journalists have mourned the gap between politically engaged parents and their politically disengaged offspring. The problem with this position is that it too easily becomes a self-fulfilling prophesy: because we expect apathy, we cease to try to engage, and we then create the very ‘apathy’ of which we complain. The consequences of this were seen in the Brexit referendum and are felt also in a too easy acceptance of unequal pay, unequal status within the workplace, and unequal parliamentary representation (we should not be distracted by the fact of a female PM when 455 male MPs significantly outnumber 195 female MPs). The student-facing UofR International Women’s Day event challenges this narrative of assumed apathy and political disengagement. It reveals that we only need to use our creativity to tap into our students’ deeply-felt commitment to issues of justice and fairness. This generation of students is more nuanced, less thoughtlessly discriminatory, and more reflective than we probably were ourselves at their age. In ‘Writing, Gender and Identity’ seminars, for example, my Part 2 students interrogate binary positions with skill and sensitivity, and in their activities in equality, diversity and inclusion campaigns, they take direct action. Some of our students in English Literature have gone on to manage new education networks in developing areas of Africa; they have worked for penal reform organisations; they have become the leader of the Women’s Equality Party (Sophie Walker is a graduate of French and English); they have held banners at Women’s Marches bearing the legend, ‘The Handmaid’s Tale is a novel – not a template!’. I am proud to say that our graduates practice what we preach: we must make sure that we do the same. At a fascinating CQSD training event yesterday, there was much discussion about how we could develop our students’ capacity for critical thinking. As I listened to our students debating at the IWD event, I understood that they have the ability and the desire to think critically, particularly about issues of equality, diversity and inclusion. It is up to us to connect with them in workshops, lectures, student forums, and extra-curricular events as we work to develop the next generation of citizens and professionals who may finally be able to produce that most elusive goal, a more equal world. 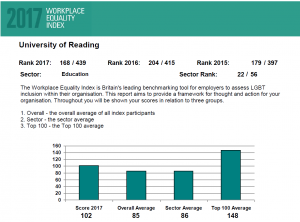 I’ve blogged before about the Stonewall Workplace Equality Index and Reading. On the LGBT Plus network’s blog I’ve talked about what is involved in a submission and talked about why – encouraged by our LGBT Plus network – we think being part of this charter mark is really worthwhile. Then last month on this blog I reported on the results of our submission into the Stonewall WEI 2017, resulting in our best marks ever and our best ever placing at 168 out of 439 submissions, compared to 204/415 last year. In that last blog I promised an update after our face-to-face feedback meeting with our client manager Jessica James from Stonewall. We had that meeting on Tuesday, Jess meeting with me, Deb Heighes and Calvin Smith (Co-Chairs of the LGBT Plus staff network), and Alison Hackett and Yasmin Ahmed from HR. Jess gave us a breakdown of our marks and a comparison with other employers, and feedback for two hours on where we did well and where we can improve. We have made significant progress from last year, both in our score (up from 78 to 102), and in our ranking in the sector (up from 27/54 to 22/56). To get into the Top 100 we would need to make the same improvement in score again – this year the Top 100 had scores of 125 and above – and we would need a further significant improvement to hit the Top 100 average. (The University’s target is to be in the top 50 by 2020, so roughly the Top 100 average.) To avoid any complacency, its worth noting that we have to make some improvement each year just to stand still, as more employers enter each year and scores get better – overall average was 78 last year and 85 this year, while Top 100 average has increased from 143 to 148. OK, so where did we do well and where is there room for improvement. Well let me start with a sample from the Staff Survey that Stonewall carries out electronically across all the employers who enter the Stonewall WEI – and Jess says our response rate was comparatively good, with 452 responses, of which 62 from LGBT employees, 390 non-LGBT. The above tables are what the survey has to say about the experiences of our LGB staff (there were too few responses from trans staff for Stonewall to give us any data back). The above data I think speaks for itself. The lower table is very encouraging compared to elsewhere, except that our LGB staff are rather less comfortable declaring sexual orientation. There is work for us to do on encouraging declaration of sexual orientation on employee Self Service for all our staff, and in understanding why our LGB staff feel less comfortable than elsewhere in declaring. Our current sexual orientation declaration rate at 60.7% of our staff is low compared to many other employers, though hugely higher than this time last year. The upper table suggests that we have more to do to make our LGB staff feel comfortable about being out at work. But I’m hopeful that our recent efforts on recruiting visible LGBT+ Allies – and I spotted over 20 LGBT+ ALLY postcards on office doors in my own department earlier this week – plus our efforts to encourage visible LGBT role models, and to make senior UEB and Leadership group LGBT role models and allies visible, will have an impact here. My last table summarises in what areas we did well, and where we have significant room for improvement. There is a very positive story in policy – though even there we have work underway, not least HR leading a major update of our trans policy and guidance with much consultation to come in the next few months. Equally we have done very well in the line managers section, in the information we push out to the leadership group (and ask to be pushed out to line managers further down), that our criteria for promotion to higher grades value commitment to diversity and, for our academic staff, explicitly value leadership in D&I and significant roles in staff network groups, including LGBT Plus. It was also very positive that we have School-level diversity KPIs, and that a number of our line managers, including in the Leadership group and UEB, have undertaken Stonewall role model or allies training, or have been very visible as LGBT role models. We have also done well on all staff engagement. There is a lot of room for improvement in several areas, but particularly training, the work of our staff network group (which only formed in 2014), and community engagement. In these three areas we have the largest gaps between our scores and the maximum scores, and also between our scores and the Top 100 average. On training we are frankly at a relatively early stage as an organisation in diversity and inclusion-related training, though with some bright spots in our training around recruitment and selection, in some of our induction training, and in our work on unconscious bias. We know we have much more to do here, much planning and implementation, and to be fair have only just in the last few months recruited a significant people development team who are leading on thinking through, with input from the Deans for D&I and others, what our training provision should be in the D&I area. Some work is kicking off already, e.g., very relevant to Stonewall concerns, work on Bystander Training, but we have further reflection to do on the many detailed Stonewall comments in this area, jointly with people development and our LGBT Plus network. initiatives, seminars and events addressing more of the L – G – B and T, and addressing intersectional issues: an example pushing in this direction was the excellent event in LGBT History Month last month with Jane Traies on her research work with older lesbians. On community engagement, while we have already upped our game, e.g. strong use of social media, Uni/RUSU presence at Reading Pride, collaborations between MERL and Support U, LGBT Plus engagement with the LGBT STEMinar, our hosting a new Thames Valley LGBT+ Workplace Network, ideas for doing more include training for staff in supporting LGBT students, consulting with our LGBT students on their needs (and action on this is in train), doing LGBT-focussed recruitment and media work, taking more of a leadership role within our sector or with our partners, and supporting campaigning or training to tackle hate crime or homophobic, biphobic or transphobic bullying. So, overall, very encouraging progress, and a lot of constructive feedback on what more we can do. I look forwards to working with staff and students across the University, but especially the LGBT Plus staff network, the RUSU Diversity and LGBT+ Officers, our VC as the UEB LGBT+ Champion, and our new University LGBT+ Action Plan Group, with the goal of making Reading one of the most supportive and inclusive of workplaces for our LGBT+ staff and students.